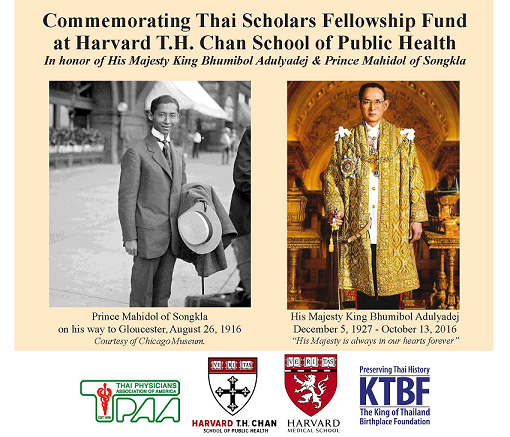 I am pleased to inform our members that with your generous contribution, the Thai Scholars Fellowship Fund has become a permanent endowment at the Harvard School of Public Health. This could not be possible without the efforts of our association and strong and continuous support from members. We are working tirelessly to raise funds for this endowment until we reach the final goal of $1,500,000. Together, we will succeed. Best of all HSPS has begun the process of awarding scholarships to a few students from Thailand, beginning this fall. Although our Fund has about $250,000, and its earned income is very small, HSPS will draw additional money from their many other endowment funds to cover the expenses of the awardees the entire academic year. That is the magic of utilizing and maximizing our efforts to help support more students from Thailand. And it is the reason why we are major supporters of the establishment of this scholarship project to begin with. Many thanks to all TPAA members again for the kind and generous responses to the call to raise funds for this consequential and honorable cause in the past. Please consider giving to this fund in your budget planning this year. We are striving to leave a long lasting legacy that we could be very proud of. I wish all of you the best of health and happiness. P.S. please mark your calendar that Harvard School of Public Health will hold a third joint medical symposium with TPAA and Thai medical schools on October 9 to 13, 2020 in Boston. Program is being finalized and will be announced soon.